The Empire State Development agency, the Islanders and the Town of Hempstead are hosting a two-part event Saturday to hear from the public about the Belmont arena project and provide a fun afternoon for families. Empire State Development is overseeing the development of the Islanders’ $1 billion proposed new arena and entertainment project at Belmont Park. The first event, a group discussion workshop, will be held from 10 a.m. to noon at Elmont Memorial Junior-Senior High School at 555 Ridge Road in Elmont. ESD wants input from members of the public on what improvements they would like to see at Elmont Road Park. An Empire State Development representative said the rehabilitation of the park is one community benefit it is providing in exchange for building the new Islanders arena. The Islanders’ community outreach team will host the second event from noon to 3 p.m. 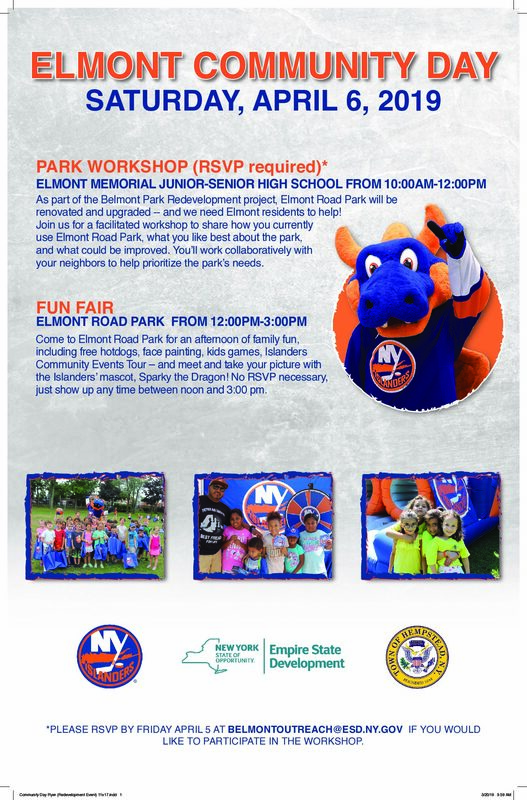 The team is calling it a community fun fair in Elmont Road Park and will provide free hotdogs and games with Sparky the Dragon on standby for the youngsters. “I encourage anyone who uses the park to join us on Saturday, let us know how they use Elmont’s largest green space, and enjoy an afternoon of family fun,” Sterne said. The events are not a requirement for ESD to complete its project approval. The organization is moving through the public approval process and anticipates having approval in the second quarter of this year. Islanders co-owner Jon Ledecky told Newsday last month the project was on track for the 2021-22 season. Empire State Development said the afternoon fair is not required for the public approval process, but it wants to make sure Elmont residents’ voices are heard. To date, the agency has held nine public meetings on the project and hosted 22 smaller community meetings. Based on the public’s input, the organization reduced the maximum hotel height by 10 stories, relocated PSEG’s proposed electric substation away from a Floral Park school and is committed to renovating Elmont’s most utilized public open space, Elmont Road Park. Several lawmakers had issues with the draft environmental impact statement passed late last year. They are concerned about traffic, noise and the horses stabled at Belmont Park. ESD said it held hearings on the draft statement in January, received more public comments and is now going through all of them to respond to the statements received. “We are still accepting public comment on our Draft Environmental Impact Statement and will continue to work with transportation agencies to manage New Yorkers’ needs as they travel to, from and around the new Belmont arena,” an ESD spokesman told the Queens Daily Eagle earlier this month. Empire State Development expects to break ground in the second quarter after public approvals and the final environmental impact statement, at which time live racing will move from Belmont Park to Saratoga for the summer season. The New York Racing Association, which oversees operations of Aqueduct Racetrack, Belmont Park and Saratoga Race Course, made minor changes to the racing schedule to accommodate construction plans. The New York State Gaming Commission has approved the Belmont Park spring/summer meet’s revised 48-day calendar. Belmont Park’s opening day is Friday, April 26, with the meet running through Sunday, July 7. The Saratoga summer meet will begin Thursday, July 11, and run through Labor Day, Sept. 2. No changes were made to the number of live racing days at Saratoga, which remain at 40. The racing association said it does not yet have a plan for the racing season’s return from Saratoga to the Belmont Park fall meet, when construction is expected to be underway. 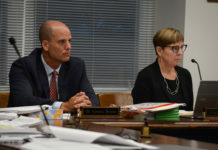 A representative for the racing organization said any decision about adjustments to the morning training or live racing schedule at Belmont Park will be made at the conclusion of the public approval process in the second quarter. Residents expected to be affected by the Islanders arena construction are urged to attend the discussion workshop Saturday and to reach out to their local governments to voice their concerns, comments and proposals.